February 2, 2017, Pope Francis granted Bishop Herzog’s request for an early retirement and the Most Reverend David Talley succeeded him as the 12th Bishop of Alexandria, Pope Francis appointed Bishop Talley as coadjutor bishop to Bishop Ronald P. Herzog on Sept. 21, 2016. 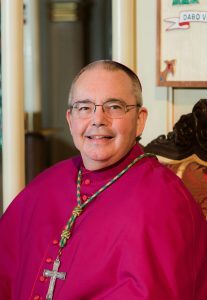 A native of Columbus, Georgia, Bishop Talley, 66, was ordained a priest on June 3, 1989, at the Cathedral of Christ the King, Atlanta, by Archbishop Eugene Marino, SSJ. He earned a licentiate and doctorate in canon law from the Gregorian Pontifical University in Rome, Italy. When he was director of vocations, the archdiocese initiated a cross-cultural immersion program for seminarians where they spent time living in El Paso, Texas, and in Juarez, Mexico, to learn Spanish and be more knowledgeable about Hispanic culture and more skilled at ministering in a variety of communities. One of his roles in the archdiocese is as chaplain to the Disabilities Ministry. His experience ministering among people with disabilities, which began at his first parish assignment, is key to his spiritual life, he said. “All they can do is ask the Lord for help. That simplicity and humility is where I think the church should be—humble before God,” he said in an interview in 2013. Bishop Talley was raised as a Southern Baptist but has said he left the church as a teenager over the issue of racial segregation. At Auburn University he met Catholics and read the writings of Thomas Merton, which led him to become Catholic. He was 24 when he joined the church at St. Mary Church in Opelika, Ala.
Family members remain faithful Baptists, including a brother who is a deacon. That background gives him a broad view, he said. “I do know a faith across the spectrum,” he said. Bishop Talley also received a master’s degree in social work at the University of Georgia. For a time before entering the seminary, he worked as a caseworker in Atlanta’s Fulton County to protect children from abuse. He studied at St. Meinrad Seminary in St. Meinrad, Indiana, before ordination, where he received a master of divinity degree. Bishop Talley also served as vicar general and director of Priest Personnel and was a member of the Council of Priests and the Committee for Ongoing Formation. He currently serves on various committees for the U.S. Conference of Catholic Bishops, such as the Catholic Campaign for Human Development, Special Assembly Planning Committee, and the Secretariat of Child & Youth Protection Services. As coadjutor bishop, Bishop Talley assisted Bishop Herzog, working in harmony with him in governance of the Alexandria Diocese. 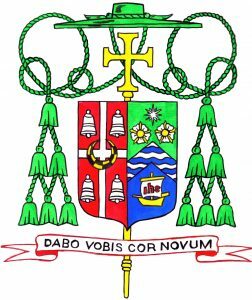 A coadjutor bishop has the right of succession. Since becoming Bishop of Alexandria in February 2017, his projects in the Diocese of Alexandria include expanding the Office of the Diaconate and beginning a new “cohort” in 2018, of fifteen aspirants, to add to the nine men who were already in diaconate formation when he arrived in Alexandria. The well-being of his priest-brothers was always one of his top priorities, therefore, he created an annual priests’ convocation and the Committee for the Ongoing Formation of Clergy. Bishop Talley had the opportunity to ordain four priests and nine permanent deacons and shepherd our seminarians in formation. He helped St. Mary’s Residential Training School begin a capital campaign that will enable them to transition their residents from living in the original dormitories into newly built homes on the campus of the facility. Bishop Talley has been instrumental in the expansion of the ACTS Retreat program within our diocese and has led to the establishment of the ACTS Mission Chapter Alexandria. The ACTS Mission Chapter is a support branch of ACTS Missions dedicated to guiding the process of Catholic communities seeking to bring the ACTS retreat to their parish. Social justice is close to Bishop Talley’s heart. He created the Office of Life and Justice, staffed by volunteers who help collaborate with social service resources in our area in order to meet the needs of our marginalized populations. In all things, Bishop Talley fostered a spirit of unity and hope in planning for the future of the diocese while building on its long history.